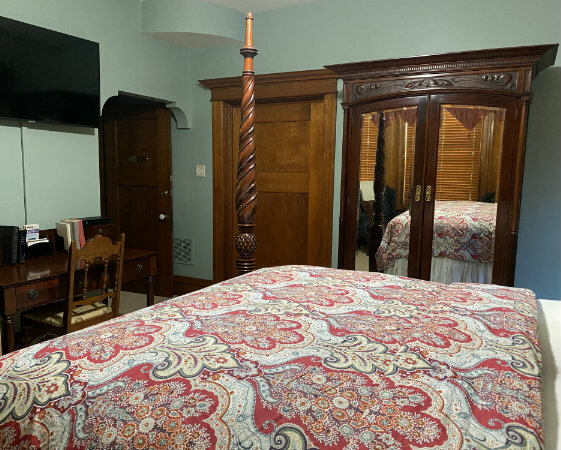 This beautiful room features commanding views of historic Reservoir Park, with its soaring stone water tower dating from the late 19th century. But what’s within this room is remarkable in its own right. Its centerpiece is a queen-sized, four-poster plantation bed that promises a heavenly night’s rest. An antique English armoire complements the bed, and of course, a nicely appointed private bath is attached. While staying in The Reservoir Park Room, why not take a walk across Russell Boulevard to the beautiful Compton Hill Reservoir Park, after which the room is named? Here, the historic, original water tower superstructure, built for Stand Pipe No. 3 in 1899, still stands sentinel over the natural landscape. You can still climb to the top of the tower, during limited public hours, for a spectacular view of the park and the city or view the two brand new tennis courts the park has to offer.